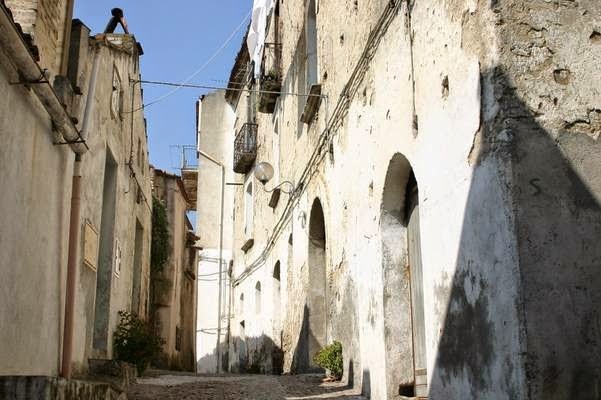 CHIAVARI, Italy – In and around the town of Senise, in the southern Region of Basilicata, they grow a special pepper called "Sweet Heat". With a name like that you might think that it is a hot pepper, but it isn’t. It’s wonderfully sweet, and it stays sweet whether you eat it fresh or dried. A better name for these beauties might have been “Sweet and Savory”. They grow a lot of peppers in Basilicata's sunny, semi-arid terrain. There are the slim chilies they call diavolicchi (little devils), because they truly do have an intense heat, and strawberry-shaped, spicy cerasello, but it is the bright red, thin-fleshed peperone di Senise that is the region's most celebrated pepper. In 1996, these peppers were granted I.G.P. (Identificazione Geografica Protetta) status, which narrowly defines the geographical region in which peppers sold under that name can grow. 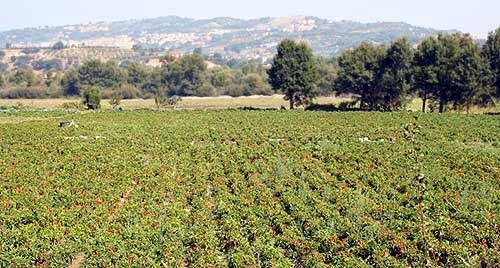 In this case it is limited to the agricultural region near the town of Senise. 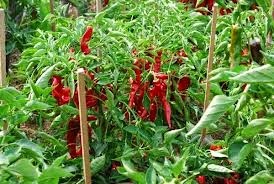 But it is not just the area of cultivation that is regulated, it’s also the way the peppers are grown and harvested. Peperoni di Senise are the backbone of a Basilicata's rustic cuisine. Fresh, they're often sliced and added to sauces, stuffed with meat or local wheat berries, or grilled and preserved in oil. 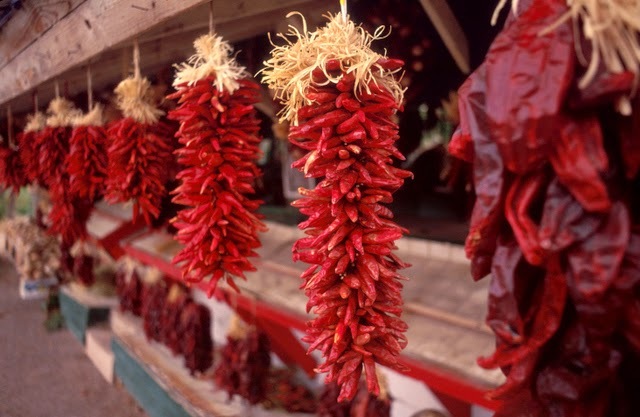 More often, the peppers are hung on long ropes and left to dry in the sun, which concentrates their flavor. The dried peppers, peperoni secchi, add a sweet, smoky notes to soups, potato dishes, and frittatas. Some cooks also pound the peperoni secchi in a mortar to extract their seeds, which are then used as a spice. The dried peppers can also be pulverized into a sweet, paprika-like powder that's known locally as zafaran (saffron). Although the peperoni zafarano is added to many dishes including breads, soups, grilled meats, and vegetables, it is most often used as a seasoning and preservative in the region's pork sausages and hams. In one best uses of the dried peppers is a simple recipe that calls for the pepper to be fried in olive oil to make peperoni cruschi, brittle, salty nuggets of flavor that are then tossed in with pasta and bread crumbs to make Basilicata’s signature dish, Pasta with Fried Chili Peppers and Breadcrumbs. In this recipe for Basilicata’s signature dish, the peppers are pan-fried in olive oil to a rich, dark burgundy color. After cooking the peppers, the oil in the pan is infused with the peppery taste, and then when you cook the tomatoes in that same oil, that flavor is transferred to them, and the entire dish. You can use cherry tomatoes if you want or canned, diced tomatoes, but they need to be cooked along with garlic and anchovies until the anchovies are soft and can be mashed gently with a fork into the sauce. Then add the sauce to the cooked pasta and mix it together and let it cook for a few minutes so the spice can flavor the pasta. This dish can be summed up with three little words: lip smacking good. 1. Heat oven to 325˚. Bake bread cubes until hard, about 15 minutes, keeping a close eye on them. Transfer to a food processor; process into coarse crumbs. Heat 1⁄4 cup oil in a 12″ skillet over medium heat. Add crumbs; cook, stirring occasionally, until golden, 8–10 minutes. Transfer crumbs to a bowl. 2. Wipe out skillet; heat remaining oil over medium-high heat. Add chiles and toast, turning once, about 45 seconds. Transfer to a plate; let cool. Tear chiles into 1″ pieces. Reserve oil in skillet. 3. Set reserved skillet over medium heat and add anchovies (if using); cook, breaking them apart with a wooden spoon, for 1 minute. If not using anchovies add garlic, tomatoes and Worcestershire/fish sauce; cover; cook, stirring occasionally, until tomatoes soften, about 10 minutes. Mash tomatoes with a fork right in skillet and season with salt and pepper. Remove from heat and set aside. 4. Meanwhile cook pasta to al dente in plenty of salted water. Drain, reserving 1⁄4 cup water. Transfer pasta and water to reserved skillet of tomatoes over high heat. Toss to combine; cook until sauce thickens, 1–2 minutes. Transfer pasta to a platter; sprinkle with bread crumbs and chilies; drizzle with a little oil and serve with fresh grated Parmesan. Sounds absolutely divine!!! When we were in Calabria the peppers used seemed to be mostly the diavolicchi. There was a pasta dish I had to literally stop eating as my mouth was numb and I wanted to be able to taste the rest of the food that was coming!! I am ready to visit Basilicata just to try this dish!! !